Even though there's a multitude of frost tolerant bromeliads to choose from, the internet is somewhat lacking with information on the matter. Here are my top picks based on personal experience, numerous resources and anecdotal information. 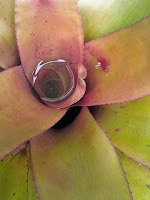 Included are bromeliads that can take freezing conditions to 20 degrees, but it is best to protect them just in case and see what works for you since there are always exceptions within each species. The genus Aechmea includes the greatest amount of cold hardy species, such as the popular "Matchstick Bromeliads", Aechmea Gamosepala and Aechmea Cylindrata, which get my picks for time proven toughness. "Blue Cones" is pictured to the left, which is a hybrid of cylindrata. These two and their hybrids are quite similar, but the majority of them feature clumping and low growing rosettes of foliage with a blue and pink flower spike with bracts resembling matchsticks. Other tough ones are A. apocalyptica, A. recurvata, A. winkleri, A. calyculata, A. caudata, A kertesziae, A. distichantha and A. Nudicaulis, though there are many more. They can be grown in well draining soil as an accent, groundcover or focal point, but its in the trees as epiphytes that they really look impressive. I recommend placing offsets in palm trees like windmills and letting them form clumps at eye level. There are a multitude of cold hardy Billbergia Hybrids with drastically different flowers and forms. Many of the toughest ones color nicely in sun, often with pink spotted foliage! Billbergia Nutans, or Queens Tears have soft and wavy green leaves that drape down nicely, especially when planted as an epiphyte. Still others, like Billbergia Pyramidalis 'Striata' or 'kyoto' have variegated foliage with yellow stripes or white margins, respectively. You can usually identify Billbergias by their slender form and short lived but magnificent flowers. Pyramidalis Hybrids are borderline for me in 9a, so make sure to give them protection. These are succulent terrestrials with amazing spiky, tightly clustered rosettes. Though there are other cold hardy terrestrials like Puya and Bromelia, Dyckia get my pick for the average home gardener for their tightly clumping nature and smaller size. Many like "Cherry Coke" and "Red Planet" have deep burgundy leaves, while others are green, bronze or jet black. The contrasting white spines look menacing yet very ornate, and actually point forward and backward! 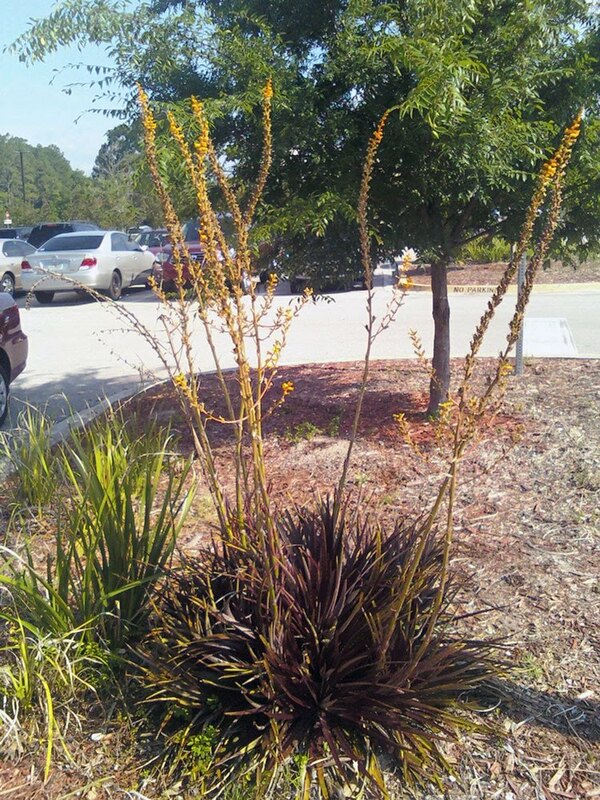 To the left is a shot of "cherry coke" flowering at the UNF campus. Grown mostly for their architectural foliage, Neoregelias have an astounding variety of hybrids to choose from, with many of the leathery ones suitable for colder winters. Neoregelia Spectabilis is a common passalong plant with pink "fingernails at the tips of the leaves, and is quite hardy in sun or frost. Neoregelias will sustain damage in the coldest winters, but they usually recover quickly. There is a clump of Neoregelia "Betty Head" growing in an old oak tree despite the recent cold winters. It took a big hit this year, but this was with no protection. My recommendation for those with hard frosts is to plant them in protected places. If you want them in trees, plant stoloniferous types at the tree's base and let them climb! When the freezes hit my local garden centers and nurseries, it was interesting to note that while the guzmanias burned to a crisp, the vrieseas got off almost scot free. Although the mother plants died, all of the pups were unharmed even though these individuals were of amazonian origin. If you're feeling a little less brave, try some of these exceptional species from Southeastern Brazil! Vriesea Philippo Coburgii, V. Vagans, V. Lubbersii, V. Corcovadensis and V. Flammea are all great choices if you get frost. My philippo coburgii was left out in the open and only received a little leaf damage! 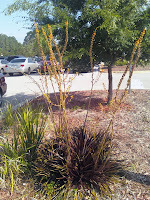 To the left is a Vriecantarea "Inferno", which is an intergeneric hybrid between Vriesea and Alcantarea. This very large hybrid is also reportedly very hardy. 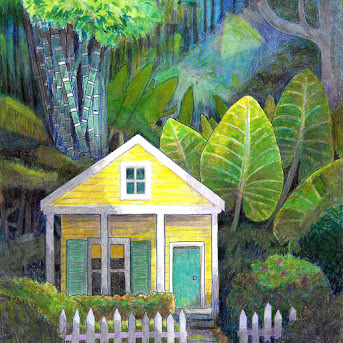 Hi Rainforest Gardener...I definitely like the new look of your blog. I especially like the 5 sections listed in the sidebar...very nice. Many of the bromeliads you listed in your post that I have in my yard survived the winter. Mine are protected by a large tree canopy and frost was not able to settle on them...which I think made a big difference. I never would have thought bromeliads would survive as far north as Jax, but I would guess that being on the coast made the difference for you. Thanks for the great info. 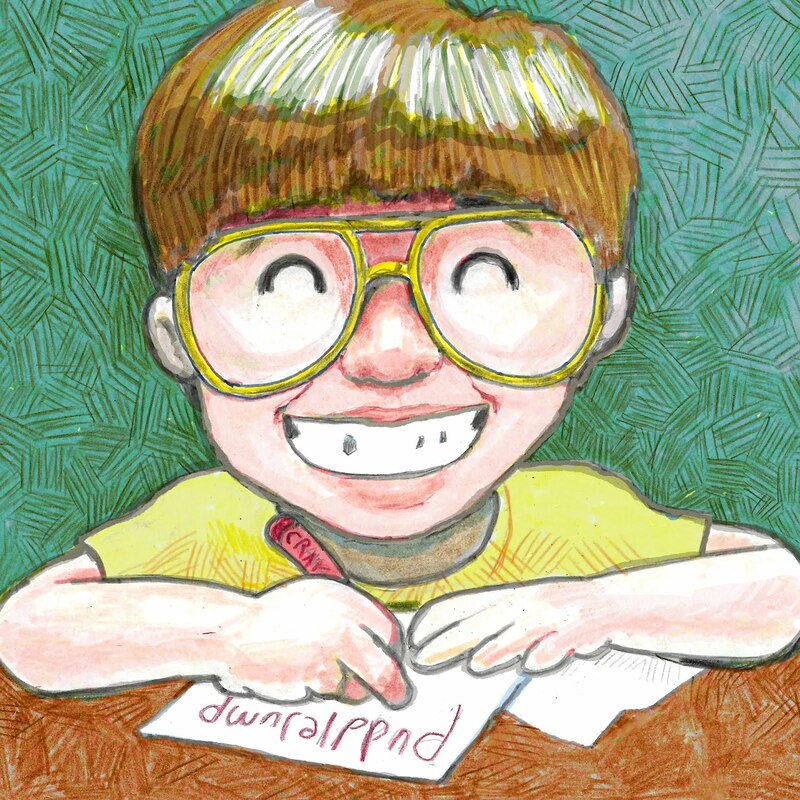 First of all, I confess that I have copied your pages in the sidebar idea. I am no artist, however, so I used some photos from my archives. 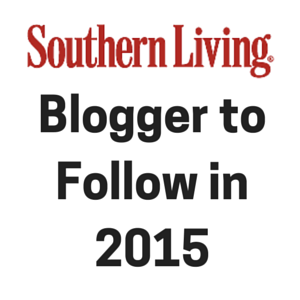 Sneaky way to get even more on my blog. As for bromeliads, you give very good advice. It's all about the microclimate, I think. My broms seem to fare very well under tree cover or close to a wall of the house or a porch. Siblings of the same exact species that thrived in shade have expired in exposed locations. Hmmm, I think I've lost specimens from many different genera that way. Wish I could send you photos of this year's crop of damaged broms. I've left them in the ground in hopes of recovery or pupping. The pups that were already there do actually seem to have more green on them than the mother plants. 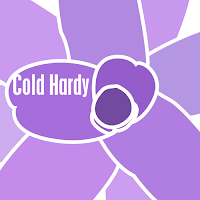 I would love to take your cold-hardy list into a nursery and shop my heart out, but where to find such a nursery? 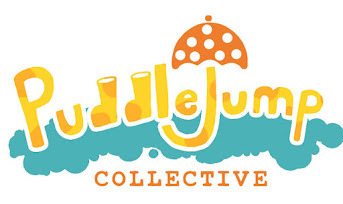 Anyone out there know of such a nursery? Even when you find broms, they are usually unlabeled or only have the cultivar name. A very interesting post. I have a vriesia 'flaming sword', which has never flowered. The matchstick plants and Bilbergia pyramidalis are in flower throughout the year here. 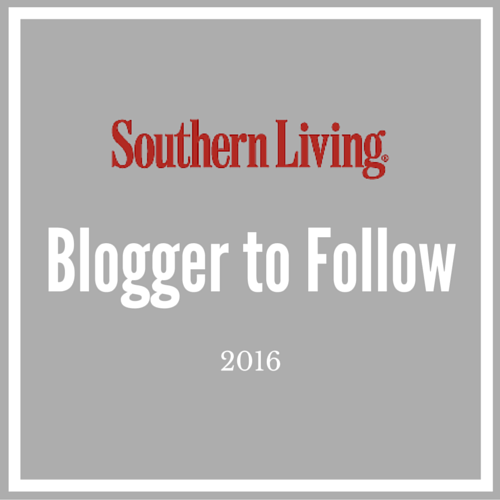 Susan: Thank you so much! I'm glad your broms survived. Most of the broms I find are from inland Gainesville, in zone 8b. I figure that if they survive their weather in the teens they can take my winters too! Floridagirl: I saw your buttons and I like them a lot! You can even adjust the margins if you want by editing the css so they're not so widely spaced. I find most of my broms by going to plant sales and festivals, such as the spring and fall ones at Kanapaha in Gainesville. There was also a great Seminole Bromeliad Society sale that we made a trip for, and some others around florida. I'll be doing a post on "How to Find Rare Plants" later! There are some places close to you too, but I'll have to research again to find their names. Lotusleaf: I have a vriesea "flaming sword" too that hasn't yet flowered, but I prefer to have a larger healthy plant before it flowers anyway. You can always force them to bloom by placing them in a bag with a banana peel or apple for a couple days. The commercial growers gas them similarly, but all too often when the plant is too small. It seems like my vrieseas take over a year to flower at least, but that's alright with me. Love the entire thing. Good job. Thanks for stopping by! 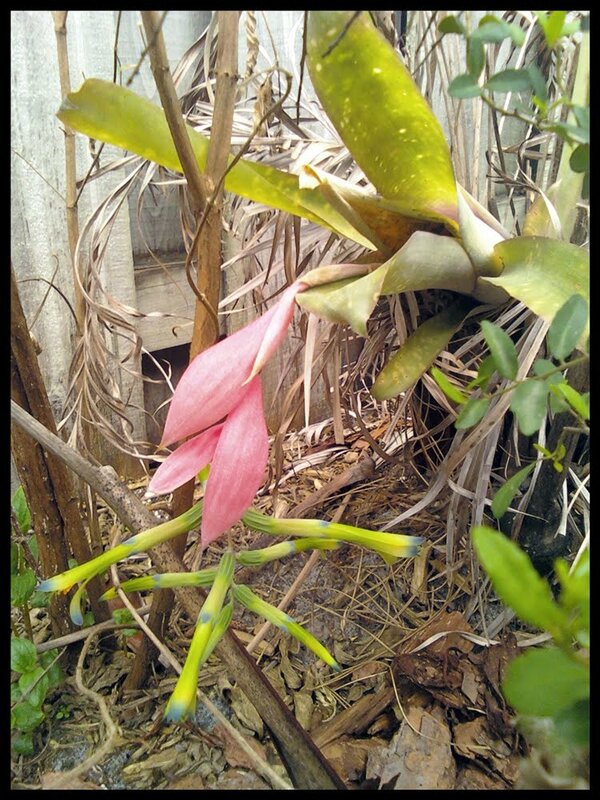 Unfortunately you are a bit too far north for bromeliads. What you can do however, is grow the broms in pots and sink them into a shady bed in the warmer months, taking them in right before the first frost! If you wound up mulch over the edge of the pots they'll look natural in their summer home, like part of the garden! 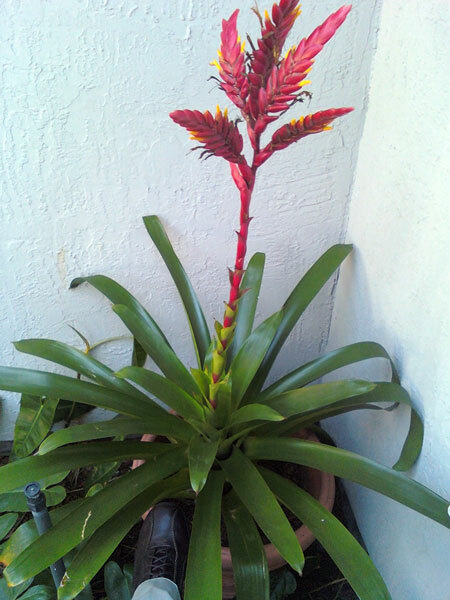 We use a lot of the same bromeliads you have recommended for outdoor culture here in northern California, as well. I grow all of the Aechmea species you list, and fortunately we seldom dip much below 29F here in my Berkeley garden, but it has gotten as cold as 24F in the past. I would probably add almost all forms of Ae. recurvata and its hybrids, Ae. nudicaulis, Ae. pineliana v. minuta, Ae. ornata v. nationalis, Billbergia sanderiana, Billbergia vittata and Alcatarea imperialis to your list of hardier bromeliads to grow. For me, Aechmea distichantha and its hybrids/cultivars, along with Aechmea kertesziae have been the most hardy. 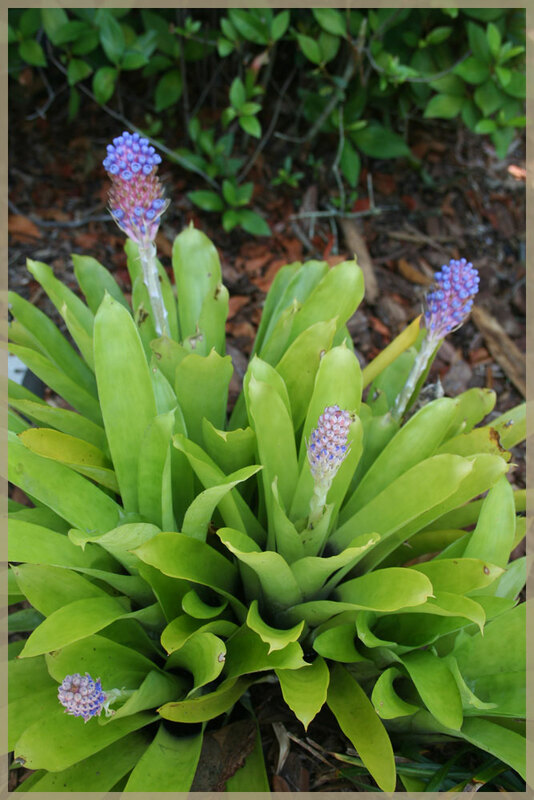 I'd also suggest that finding these isn't quite so difficult anymore, mail order nurseries such as Michael's Bromeliads in Florida can satisfy your urges for a lot of these species and hybrids. I know that I had to start my own personal collection of outdoor hardy bromeliads from the plant table at local San Francisco Bromeliad Society meetings, which is probably also a great way in other parts of the country as well. Since that first meeting some 25 years ago, I have now amassed suitable quantities of various hardy bromeliads planted out in landscape clients' gardens to be able to sustainably divide, harvest and further spread the wealth into new clients' gardens. Plunging pots of bromeliads into the summer garden and wintering in a cool greenhouse or sunporch is an excellent method to achieve the look without risking them outdoors in the winter. If I had the room for a greenhouse or more winter light indoors, I would do this myself here in zone 9b California conditions so that I could grow things like Aechmea blanchetiana, but I don't have the room, so I don't grow the more tender stuff, except to treat them as expendable annuals. I might also suggest that smaller bromeliads such as Neoregelias can look superb in hanging baskets combined with other epiphytic things such as Rhipalis and succulents such as Graptopetalums. 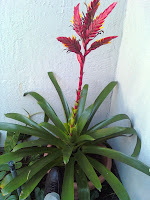 I just figured out what a red bromeliad that I have in my garden is and I think you should check it out. Even with mild frost protection of plike a palm tree it sailed through the winters of 09-10 with no problems. The hybrid is called xCryptbergia rubra and it is perhaps my favorite bromeliad! It matches very well with that florida gold sedum. So funny that you should mention Cryptbergia rubra! I purchased one in fall and have left it outdoors this winter unprotected too, with no damage at all. I eventually figured out what it was and sure enough, Cryptbergia rubra is supposedly hardy down to 20F. I planted it under the oak tree and will see how it does next winter! Nice suggestion on the gold sedum too! Make sure it gets sun or it turns to an olive-y green that isnt particularly attractive. I have some growing in the crook of an oak tree that are growing well and I'm trying one on the side of an oak to see if it can grow like that too, that way it could get more sun. Puyas, Ochagavias, and Fascicularias are good cold-hardy bromeliads for climates that don't get too hot and moist in the summer, like California. Not very tropical-looking, though.